The EU is to suspend most of its sanctions against Belarus including an asset freeze and travel ban on President Alexander Lukashenko. The decision follows the freeing of the country's remaining six political prisoners in August. The US has also said it will ease sanctions, but urged Belarus "to improve its record with respect to human rights and democracy". Mr Lukashenko is believed to want closer ties with Western countries. He is reported to be eager to reduce Russia's leverage as he comes under pressure from Moscow to allow a Russian air base in his country. Russia wants to establish the base to counter what it sees as Nato's eastward advance, but Belarus argues that such a base will not reduce military and political tensions in the region. In a statement confirming its decision, the EU said that it was taking account of "the context of improving EU-Belarus relations". From Saturday it will suspend "for four months the asset freeze and travel ban applying to 170 individuals and the asset freeze applying to three entities in Belarus," the Council of the European Union statement said. However an arms embargo will remain in force as will sanctions against four members of President Lukashenko's security services who are suspected of orchestrating the disappearances of political opponents. The move will be reviewed at the end of February and sanctions could be re-imposed if the EU sees a deterioration in human rights, the rule of law and press freedoms. The US Treasury for its part said that from Saturday it would allow most transactions with nine sanctioned entities in Belarus for the next six months. State Department spokesman John Kirby said the US was taking the step "in light of the positive move by the Belarusian government to release all six of its political prisoners on 22 August". Mr Kirby said that the move "opens the door to expanded commercial ties" while urging the government of Belarus to do more "to improve its record with respect to human rights and democracy". Correspondents say that EU officials are eager to promote democracy in countries that neighbour the EU in central and eastern Europe. President Alexander Lukashenko won his fifth term with a landslide 83.5% of the vote on 12 October. But observers from the OSCE security body said it fell far short of the country's democratic commitments. 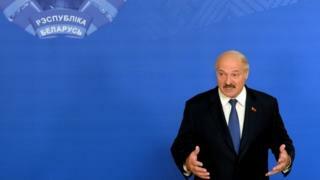 Mr Lukashenko, 61, has governed the former Soviet republic almost unchallenged for 21 years. Why does President Lukashenko take his son to work? Why does Belarus President Lukashenko take son Kolya to work?